Two gorgeous cards .. .. and I love the little MB heart border. Haven't seen that before! Pleased you have had a good time with your Grandson. They are both so gorgeous, Sylvie! You always do details so well! Glad you had a fun time with your grandson. I am sure you will miss him but look forward to seeing him again! Both your cards look gorgeous, Sylvie. Love all the detail and your embellishing. Gorgeous cards, Sylvie. Love all the fabby details on each. Beautiful cards Sylvie, love the scroll on the first one. 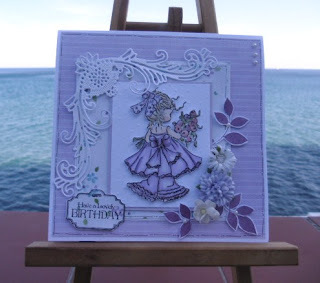 Two absolutely gorgeous cards Sylvie! 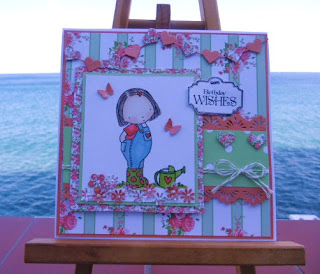 Love the images, colours and embellishments. Both of these are so very lovely, Sylvie! I think I like the Cheery Lynn...love the hearts and papers and your coloring!!! I guess that means I love all of it!